Last week, I shared with you a book I'm looking forward to reading and how I couldn't find anything on the author, Elizabeth Camden. By the next day, I had answers to my interview questions in my inbox! I'm so happy to help you get to know Elizabeth Camden, and also to let you know that I'm REALLY looking forward to The Lady of Bolton Hill now, it will undoubtedly be one of the best books of next year. I’m afraid there is not much to tell. I am a mild-mannered librarian by day, but at night I am scribbling away like a maniac on my next manuscript. I absolutely adore writing and am thrilled to pieces that I have a shot at publishing some of it. I got married pretty late in life (thirty-five), so I never had children of my own, but it gave me plenty of time to pursue writing. I live in central Florida with my husband, Bill. I like old Hitchcock movies, the hour before sunset, digging in my garden, and a good college football game. As soon as I read the synopsis for your book, I was interested. How did you develop this story? One of my favorite romantic plots involves lovers who are reunited after several years apart. In The Lady of Bolton Hill, Daniel and Clara were quite young when they met and shared one of those intense, immediate bonds that can sometimes flare up between teenagers. They are separated by Clara’s disapproving father. The book begins when Clara returns to the United States after more than a decade abroad, and the chemistry between Clara and Daniel immediately kindles back to life. The problem is, they have followed such wildly divergent paths that they don’t know if they can find a way back to each other, even though they both crave it. Something that was very important for me is that both my characters be very passionate people, but who are still fiercely intelligent and sensible. Have you ever read a book where the conflict between the hero and heroine could be solved by a simple, honest conversation? There was no way I was going to let Daniel and Clara off the hook so easily! Although it is clear they are madly in love, they will be put through the wringer before they can get to a happy ending. I love a good turbulent story with love, betrayal, heartbreak, all punctuated with periods of soaring joy and utter delight. That is what I aimed for with The Lady of Bolton Hill. I’ll be curious to hear from folks if they think I got it in the ballpark. What has the process of publication been like for you? It has actually been one of the best experiences of my life. Although writers tend to become very protective of their work and resent any editorial interference, overall, I have loved every step of this journey. I have had my fair share of rejection and disappointment. It took me years of writing before I had a manuscript that was worthy of publication, and those years came along with plenty of self-doubt and heartache. One of my favorite quotes is from A League of Their Own, when Geena Davis has reached her breaking point and is getting ready to throw in the towel. Tom Hanks scolds her, “Of course this is hard. If it was easy, anyone could do it. 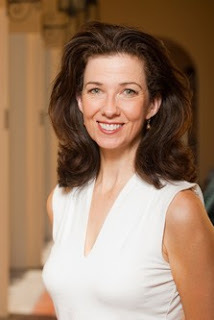 It is the hard that makes it great.” I think this line is true in almost any endeavor that is really worthwhile … starting a business, raising kids, training for a sport, writing a book. It is the hard that makes it great. So although I have found the publishing process much harder than I originally anticipated, it has been worth it. The folks at Bethany House could not be nicer, and it has been a real privilege to work with them. Your book doesn't release until June (boo!) What are the steps you have to take between now and then to get ready for publication? Well, after I saw your blog post, I learned I had better get online! Publishing a novel is entirely uncharted territory for me, so I had no idea that there would be interest in me this early in the process. Your post made my day (my week, my month, my year …). I am planning a really terrific, comprehensive website … but these things take time. I contracted with a web designer who is very much in demand, but she is the best, so I am willing to wait. I am told my site won’t be ready until early 2011. What are some books you'd recommend to readers while we wait impatiently for yours? You can’t go wrong with Francine Rivers’ Redeeming Love, probably my favorite book of all time. I love the storm and stress, the tears, the hope, the joy. I’m afraid I haven’t had much time to keep up with more current releases. The writing has devoured most of my free time. If you could pitch your book to a group of your ideal readers, who would they be? Hmmm … I think my writing would appeal to people who like characters with a bit of an edge. I like to write about people who have huge dreams and are willing to risk everything in order to make them happen. When they fail, they do so in a spectacular fashion. When they love, it is with both hands stretched out and no-holds barred. So my ideal reader is someone who loves a good stormy romance, but also wants glimpses of wit, delight, and joy sprinkled in amongst the drama. Thanks so much Elizabeth! We're looking forward to your book. 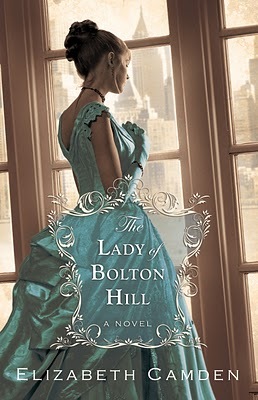 Again, The Lady of Bolton Hill releases in June, and is one of my most anticipated books of the year!